As Duffy and his ace sidekick, DC Alexander Lawson, investigate the burglary, they meet reporter Lily Bigelow, who is both “[p]retty and funny” (she gets Duffy’s attention with a “War of the Worlds” joke) and is there to cover the Finnish delegation’s visit. They meet the Finns: the inscrutable Mr. Laakso, the creepy Mr. Ek, and giggly twins Nicolas and Stefan Lennätin — some head honcho’s sons or grandsons, just along for the ride. They also run into a former colleague of Duffy’s, Tony McIlroy, now running his own private security firm with the Finns as clients. The following day, Duffy gets another early-morning call regarding an apparent suicide at a local castle. And that’s when things really take off. What a group of visiting Finns, a foreign reporter, and a puzzling death have to do with each other is the kind of tangled web that, happily for us, marks Duffy’s professional life (and sometimes his personal one, too). Duffy seeks professional and personal solace in fine Scotch, Ella Fitzgerald, a bit of a smoke in his garden shed, and, when things get really rough, Valium with vodka gimlet chasers. And, hard as he rattles cages, he’s got the unyielding respect of most of his colleagues. Through Duffy eyes, McKinty captures the mood and flavor of a city and country perpetually under siege, the life of a detective at work during wartime. 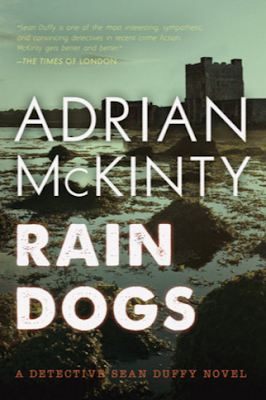 From the very first Sean Duffy novel, McKinty has melded those two elements elegantly and seamlessly together — think television’s “Foyle’s War,” for example — and this investigation is no exception, the police following leads in a particularly mesmerizing mystery while perpetually checking for potential bombs under cars. McKinty also excels at scene-grabbing set pieces: This novel opens on a terrific one with a massive crowd — including Bono — fixated on a visit from Muhammad Ali. From a riff on The Champ calling The Troubles-immersed Belfast “beautiful,” to nimble cultural-pulse-point references such as Jesse Jackson, Néstor Almendros, and Jim Henson’s Creature Shop, Duffy’s voice comes across loud and clear. Thanks to Douglas Adams’s “Hitchhiker’s Guide to the Galaxy,’’ I know that five-book trilogies are rare but hold great potential, so I’m delighted to learn that McKinty is taking things even further: In a recent blog for his UK publisher, McKinty explains that he decided to keep going with the series because Duffy had the potential to change, to become more complex. It speaks volumes to the character he established, that, rather than making this latest book feel contrived, McKinty’s decision has breathed new energy and vigor into his novels: Duffy’s not just growing naturally into this larger space, he’s taking us right along with him.